The Terra de Caldas offers you the history and culture of fishing villages and picturesque towns with plentiful street cafés and restaurants featuring authentic local cuisine and fine wines. 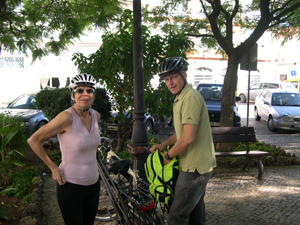 The start of the tour is in the town of Loulé, well-known for its market. Join the hustle and bustle as the locals come together to sell their goods. You'll be amazed at the variety of fish, fruits and fresh vegetables. While cycling the inner roads between Loulé and Alte, you will discover a world of peace and tranquility. Alte is one of the most attractive typical villages of Portugal. It is well-known for the quality of its fresh spring water at "Fonte Grande" and "Fonte Pequeno". The tour continues in the direction of Silves, a lovely old town situated on the river Arade. You will cycle on quiet back roads surrounded by orange trees and cork oaks whilst breathing in some of the most unpolluted air in Europe. Of Phoenician origin, Silves was once one of the most thriving centres of the Arab-Iberian world. Then called Xelb, it was inhabited by the Moors, who introduced their culture (scholars and poets), architecture and agricultural techniques to the Algarve. In those ancient times, Silves was an important city, more important even than Lisbon. From Silves you will move to the northern part of Algarve, to the ranges of "Espinhaço de Cão" and "Serra de Monchique". This brightly-coloured region, with its fig trees, orange groves and almond trees, is also the most verdant and fertile. "Caldas de Monchique" owes its fame to the hot mineral baths, frequented by the Romans and later by the gentry of the Middle Ages. Its sulphurous water is thought to help rheumatism. Caldas has undergone major renovation, intended to restore the village to the spa centre it once was. Moving west, you enter Aljezur. Situated on the western Atlantic coast of Portugal, Aljezur differs enormously from the tourist resorts. The beaches are shingled and exposed to the winds. The town is dominated by a Muslim fortification with a cistern and its typical round towers. 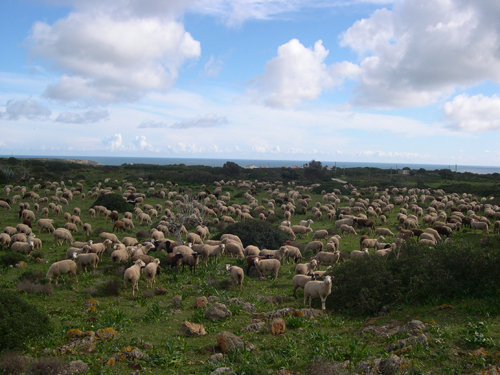 Cycling in a southerly direction, we are in the middle of the "Costa Vicentina Natural Park". This park is a feast for the eyes, a landscape vibrant with natural beauty, so little touched by the passing centuries that it seems barely to have registered man's presence at all. It offers unparalleled vistas of a truly wild coastline. Towering cliffs drop hundreds of feet into the sea. See vast stretches of pristine "empty" beaches, rich inter-tidal ecosystems with rare plants and animals. This is a paradise for bird watchers, nature lovers, artists, photographers and soul-searchers. For all the world-class discoveries credited to Portuguese explorers through the centuries, thankfully a stunning part of Portugal is left for us to discover. During the last part of the tour, you visit the southern coastline, which consists of a long stretch of fabulous sandy beaches, broken up by extraordinary rugged cliffs and fantastic grottoes. Land of fishermen facing the Atlantic Ocean, the Algarve is a paradise for anyone who enjoys fish and shellfish. Each day, at the break of dawn, the boats arrive with the harvest collected in their nets during the night. The most striking craft is the making of decorative tiles known as azulejos, a technique the Portuguese learnt from the Moors. Some climbing is involved on this holiday although none of the routes take you above 300 meters. Prices p/p include 7 nights accommodation, breakfasts, complete luggage transport, transfers from and to Faro airport, detailed maps and instructions, descriptions of the area and recommended places to visit. With back-up service.